Although the streets of South Philly do not have the glamour typically associated with Rome, the ethnic neighborhood definitely boasts some of the best Italian food in America. Several generations of Italian immigrants have settled in South Philadelphia, sharing their cuisine and selling their groceries on the curb of 9th street, which is known as the Italian Market. On this narrow and crowded street you can find stores such as Di Bruno’s Bros. for the best cheeses and olives, Sarcone’s Bakery for freshly baked breads, and Isgro’s Pasticceria for cannolis that are literally, to die for! Of course, there are also some truly amazing and authentic Italian restaurants too! Since I am always on the hunt to find great Italian food (as it is my favorite kind of food to eat), I was very excited when my mom told me that we would be trying Modo Mio on Girard Ave for a family dinner. It was highly recommended by one of my mother’s Italian friends and it also had really great online reviews. Upon arriving at the restaurant, we walk in and find that we are the first diners of the evening. But when we asked to be seated at different table, we quickly found out that we would not be the only diners of the evening; every table had already been reserved. So we took our seats and got to interrogating the waiter, which is what my mom and I do at every meal (of course, while my dad rolls his eyes in annoyance!). We ask what dishes are most popular and which ones are house specialties. We ask about the business and the background of the owner and/or chef. And we also try to find out the best way to order at each restaurant. Our waiter at Modo Mio suggested doing the “La Turista Menu,” which is a four-course meal composed of an appetizer, pasta, entrée, and dessert. And for the price of just $33, none of us could resist! The best part was that it was not a pri fix or limited menu. You got to order off of the regular menu and select one item of your choosing from each category. But before we even had the opportunity to order, food was already being brought to the table. 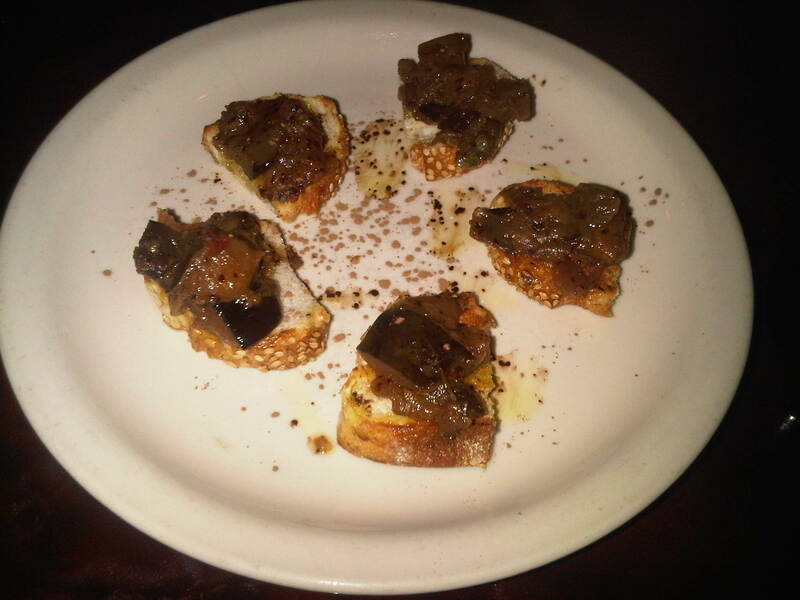 We received a plate of complementary Bruschetta Toasted topped with Grilled Eggplant and Cinnamon as well as Fresh Grilled Ciabatta Bread with Homemade Ricotta Cheese and Olive Oil infused with Porcini Mushrooms. My mom always says that you can judge a restaurant by the quality of its bread, and you better believe that we all got pretty excited for our entrees after trying this stuff. It was amazing! The ricotta was as creamy and smooth as butter and the olive oil had a tremendous earthy flavor from the mushrooms. The bread was also fantastic with a nice crispy crust and a soft warm center. The eggplant bruschetta was unique because of the cinnamon spice, but I thought it was a nice touch that rounded out the flavors well. Now that our appetites were going, we got to ordering our courses. For my appetizer I had the Creamy Potatoes with Lump Crab and Sweet Roasted Red Peppers. I was unsure as to how it was going to be served, and I was pleasantly surprised when it came out on top of more of that delicious bread!! It was definitely a rich appetizer, but it was too good to leave any behind. The crabmeat was abundant and not overshadowed by the potatoes. The roasted red peppers were perfectly placed atop the whole dish, and they added a great sweetness to every bite. I also tried the Mussels in Spicy Red Sauce, which were so tender and the best that I have ever had out! The sauce was great with salty capers and just the right amount of red pepper flakes for heat. My sister ordered the Egg Dipped and Fried Mozzarella Grill Cheese Sandwich with Lemon Caper Sauce, which I thought would be the grand-daddy of all grill cheeses, but I was disappointed by the strength of the lemon sauce. I thought it was too pungent and overwhelmed what could have been a really great dish. 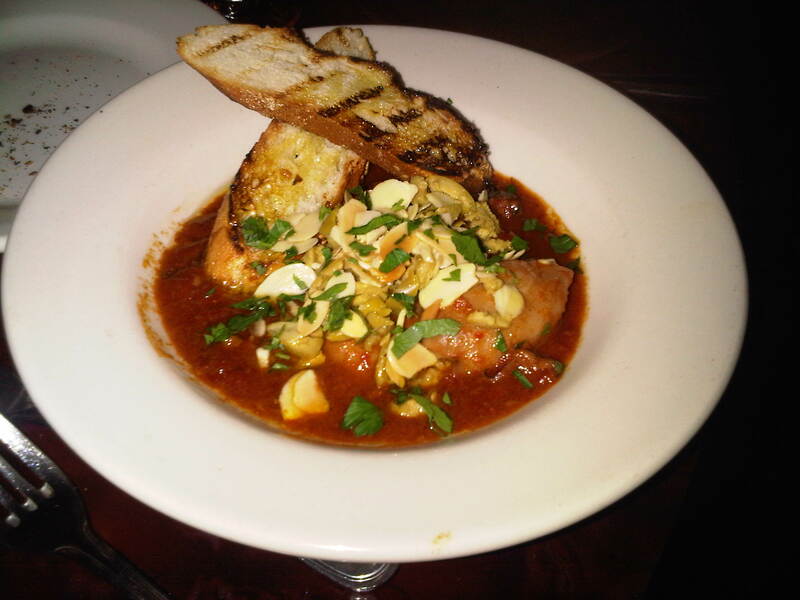 My other sister, Hannah, ordered the Calamari Stewed in Red Sauce with Capers and Olives. I thought it was good, but still prefer crispy fried calamari (call me unrefined…but at the end of the day they taste better to me!). I also had a bite of my dad’s Seared Scallop atop Fried Chickpea Pancake. The chickpea pancake was fabulous and so was the scallop, but the portion was rather small for my liking. My favorite course of the meal was the pasta! The next time I go to Modo Mio, I am going to ask to order two pasta dishes instead of an entrée. 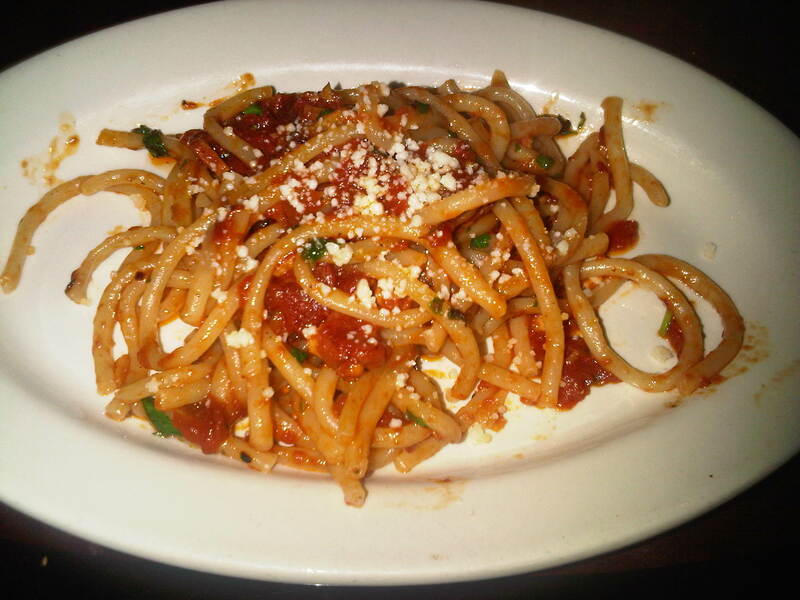 I ordered the Buccatini Amatriciana, which is a thick homemade spaghetti with pancetta in a spicy red sauce. The pasta was actual perfection, from texture to cook time, and the sauce was very nice. It was rich (and a bit oily) because of the pancetta, but worth every calorie! The Gnocchi with Porcini Mushrooms, Peas, and Pancetta in Gorgonzola Sauce was also rich, but undoubtedly the best gnocchi I have ever had the privilege of tasting. They were soft delicate pillows of potato and pasta that melted in your mouth. I was also pleasantly surprised by the gorgonzola cream sauce, which in some miraculous way tasted light! 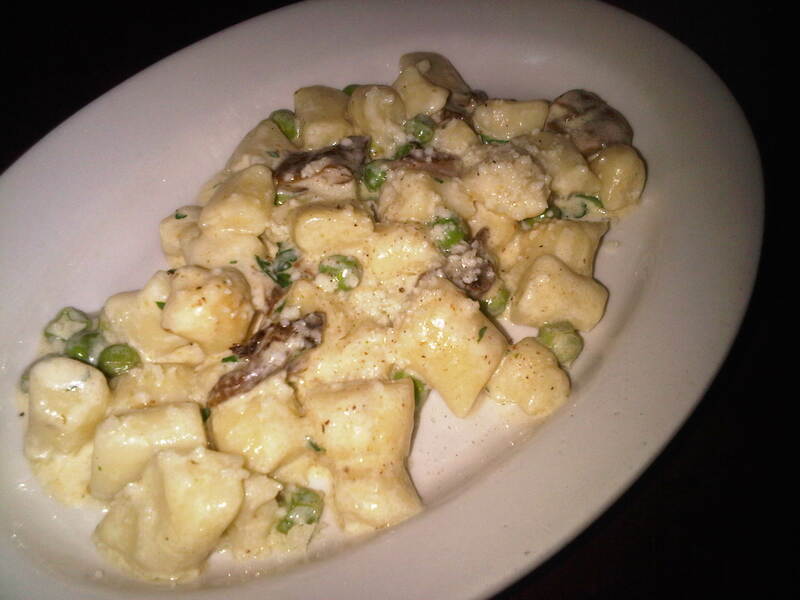 The purses of gnocchi were not swimming in sauce, but lightly coated in it, which was nice. I think that this is the must-try menu item at Modo Mio. My other favorite pasta dish was the Carmelli Pasta Purses filled with Taleggio Cheese in a truffle-rosemary butter sauce. This dish was probably the richest of all the pasta dishes, but also really, really, good. Taleggio cheese is very strong (sometimes called the “stinky cheese”) but when it is melted and gooey, it is delicious. My least favorite pasta was the Lasagna topped with a Fried Egg. I thought it was too rich to even taste good. The plate was covered in oil and the fried egg was just too much. I only had one bite and found that I couldn’t get the greasy feeling out of my mouth, so I would have been disappointed to have ordered this as my meal. For my entrée I ordered Skirt Steak with Green Olives and Fried Chickpeas. Although it was cooked perfectly, and tender and juicy, I thought it was way too heavy after all the previous food that I had eaten. 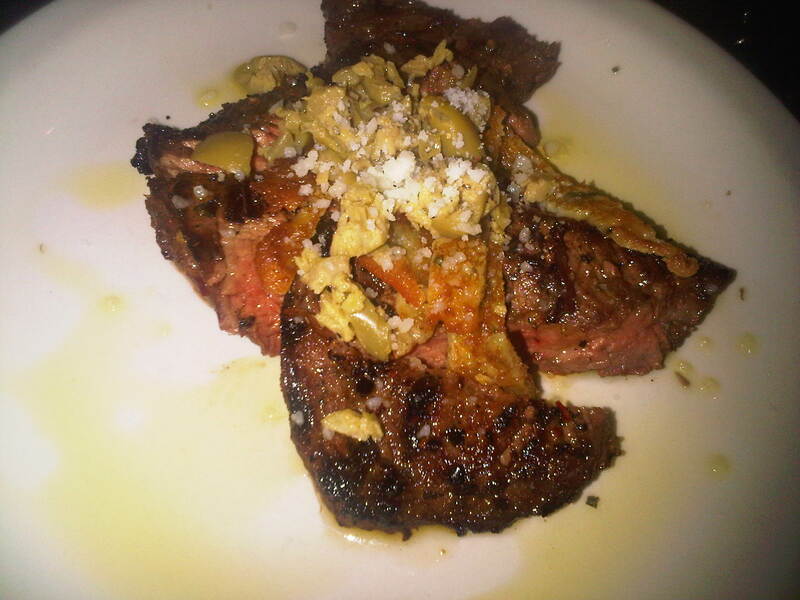 I enjoyed the finely chopped green olives atop the steak, but the fried chickpeas, which were done in little flattened strips (an Italian version of the French Steak Pomme Frites) were far too oily. I only had a couple of bites of my entrée, and would have been satisfied without it. 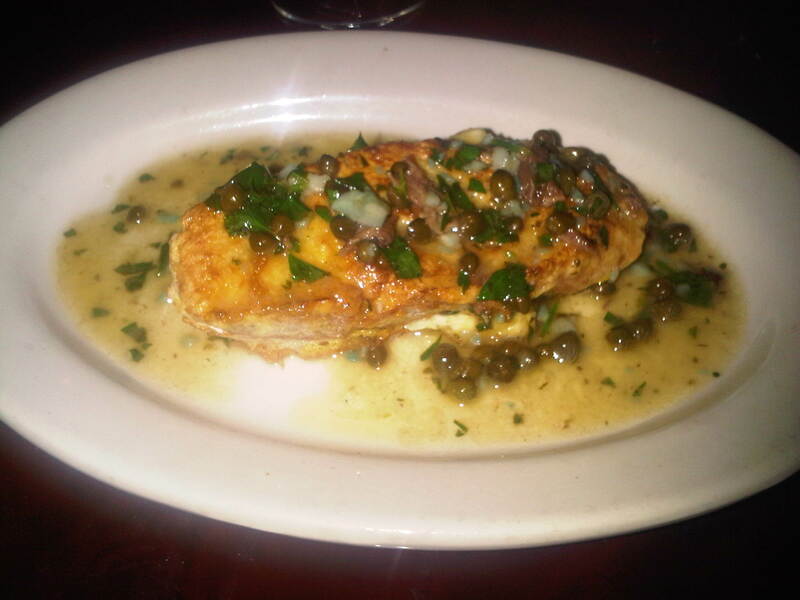 I would definitely recommend ordering a fish as an entrée, because it is on the relatively lighter side. 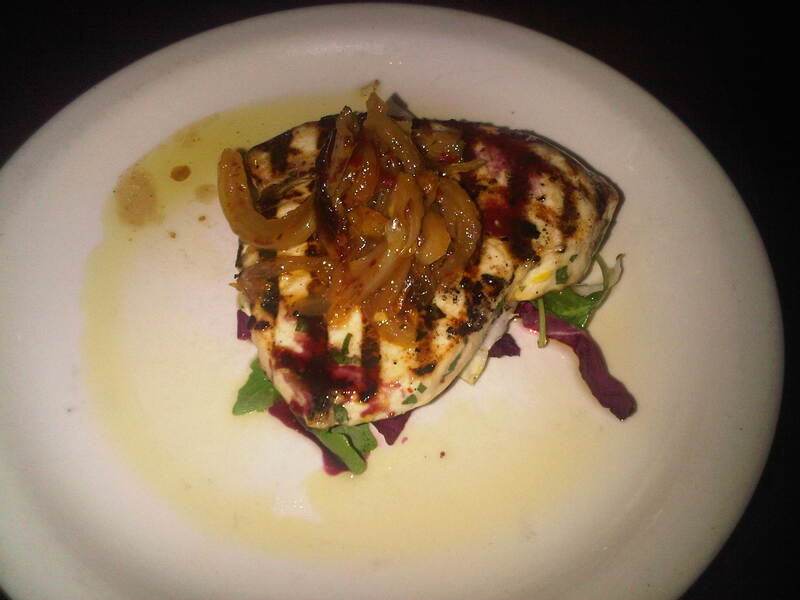 My dad ordered the winning entrée, which was Grilled Swordfish with balsamic caramelized onion, golden raisins, pine nuts radicchio, smoked mozzarella, and rosemary pangrattugiato. This flavor packed entrée, just seems to melt in your mouth. It was by far my favorite entrée. And last but not least, DESSERT! 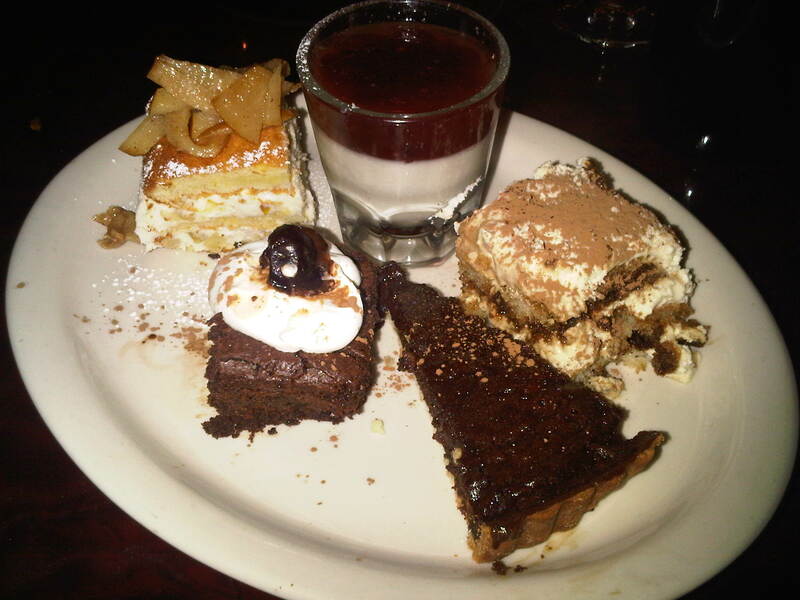 The four courses add up to a lot of food, but please make sure that you save room for dessert because it is worth stuffing yourself uncomfortably for. My family decided to sample 1 of every dessert rather than each ordering our own, so that we could have a greater variety. We had Flour-less Chocolate Cake (very dense and tasty), Torta Della Nonna (with orange flavor and shaved caramelized apple topping), Chocolate Hazelnut Pie (dense, rich, deep nutty flavor, delicious), Panna Cotta with Cranberries (the panna cotta had no vanilla flavor and was dull, the cranberries were too sweet and too syrupy), and Tiramisu (one of the best tiramisu’s that I have ever tried, fabulous!). If I were to go back again, I would order the Torta Della Nonna or the Tiramisu and definitely stay away from the Panna Cotta. I honestly think that this is one of the best food deals to be had in the city. Not only is it a lot of food for a reasonable price, but it is also incredibly delicious! I would love to go back, and would highly recommend it to others. Hands down a delicious restaurant that packs in the flavor to small well-done dishes. Complimentary shots on the chef! Great review! !